Photo taken Friday, Nov. 28, 2008 at the Fort Worth Parade of Lights in Sundance Square. On the Friday after every Thanksgiving tens of thousands of North Texans fill the streets of Sundance Square to usher in the holiday season with the annual Parade of Lights. This year's parade, sponsored by XTO Energy, is expected to be no different when the parade kicks off at 6 p.m. Nov. 28. Since 1983 the parade has grown to include more than 100 floats, each with more than 12,000 lights, antique cars, marching bands, equestrian performers, carolers and more along the 1.6 mile long parade route. Also in attendance will be crowd favorites DFW Unicycle Club's UniPsychos and the world-famous Wheelie-ing Elvi, all donning lights and the season's regalia to celebrate this year's theme of "Together for the Holidays!" Bringing up the tail end of the parade will be Santa and Mrs. Claus, who will be riding in a specially designed, LED-lit, grand finale float, sponsored by parade producers, Downtown Fort Worth Initiatives, Inc.
Miguel Harth-Bedoya, Grammy-nominated and Emmy-winning music director of the Fort Worth Symphony Orchestra, is this year's Grand Marshal. "XTO Energy and its employees are pleased to support what has become a treasured Fort Worth tradition," said John Podraza, business services manager at XTO Energy, the new title sponsor of the Parade of Lights. "It's our holiday gift to the community, and we hope everyone is able to come out and enjoy the festivities." With tens of thousands of people expected to attend, getting a good seat or view could be tough. Organizers have made available reserved seats along the parade route for $9.50. For $26.50 Gold Seats can be reserved that include padded seats, hot chocolate and warm, private restrooms. For $85.50 per seat, a luxury seat can be reserved that includes everything in the gold package but includes free valet parking and seats elevated four feet above the ground for "incredible views." Yet another way to secure a seat is to take part in the third annual Mrs. Renfro's Salsa Night of Lights Fitness Walk. Participants walk the parade route in front of spectators, ahead of the actual parade, and end up in reserve seating with free souvenir lights. The fitness walk is $20 for kids and $22.50 for adults. Free parking is abundant in downtown, but often fills up quickly on the night of the parade. Attendees can also park at Farrington Field for free and ride The Fort Worth Transportation Authority's (The T) Route 7 enhanced bus service to downtown, beginning at 2 p.m. and ending at 10 p.m. for $1.75 (one-way) or $3.50 (round-trip). 2 p.m. -- The T's enhanced bus service from Farrington Field to Downtown Fort Worth begins. Restaurants and retailers throughout downtown will be open for revelers to enjoy holiday shopping, dining, décor, music and entertainment. 4:30 p.m. -- The world-famous Wheelie-ing Elvi begin their journey around the parade route, in addition to jugglers, stilt-walkers, and other street variety acts. Parade seating begins. 5:30 p.m. -- The Cowboy Santas begin their trip around the parade route collecting toy donations. 5:40 p.m. -- The 3rd annual Mrs. Renfro's Salsa Night of Lights Fitness Walk begins. 6 p.m. -- The 2014 XTO Energy Parade of Lights officially begins at Belknap and Throckmorton Streets. The parade will proceed east on Belknap Street, turn south on Commerce Street, turn west on 9th Street past the Convention Center, and turn north on Houston Street all the way to Weatherford Street. 7 p.m. -- Santa begins his trip along the parade route on the Downtown Fort Worth Initiatives, Inc.'s grand finale float. 7:01 p.m. -- Parade volunteers will pass out recyclable litter bags along the parade route and encourage attendees to dispose of their trash to make it the "Cleanest Holiday Parade in America." 7:15 p.m. -- The volunteer cleanup crew will collect litter bags in a specially marked truck. 7:30 p.m. -- Photos with Santa will be taken under the Sundance Square Christmas tree, with proceeds supporting the Scholarship Programs of Fort Worth Sister Cities. 10 p.m. -- The T's enhanced bus service makes its last departure from Downtown Fort Worth to Farrington Field. Just a reminder, in 2013 the annual tree lighting in Sundance Square was moved to a different night to allow more families to attend. This year, the city's 58 foot tall Christmas tree will be lit at 6 p.m. Nov. 22 in the Sundance Square Pavilion. 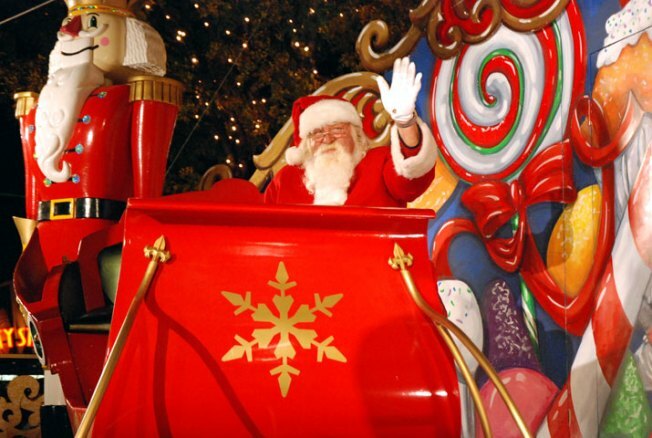 Santa Claus is expected to arrive to visit with children at 7 p.m.
For additional event information, visit the XTO Energy Parade of Lights' website at FortWorthParadeOfLights.org or on Facebook or Twitter.